Kavanaugh Looks Like The Justice To Watch On Partisan Gerrymandering The court once again appeared divided on whether redistricting could be done on the basis of politics. The newest justice seemed to be at least open to considering it as a problem. Supreme Court Justice Brett Kavanaugh had some sharp questions about partisan gerrymandering, as the court heard arguments on it Tuesday. One of the House Democrats' high-profile pieces of legislation would require states to use independent redistricting commissions for congressional districts. Kavanaugh, a Republican who lives in Maryland, was active in questioning and seemed to show some openness to the idea that drawing district lines for partisan advantage is a genuine problem. "Isn't proportional representation a judicially manageable standard?" Kavanaugh asked of Paul Clement, the prominent conservative attorney defending Republican redistricting in North Carolina. "Well, it's — it's — it's a difficult standard," Clement responded. "It would require answering some questions about where its baseline — what elections do you get the baselines from, but it could be manageable." Kavanaugh's next question: "Why can't the Equal Protection Clause be interpreted to require something resembling proportional representation?" Clement noted that the framers of the Constitution gave state legislatures the power to draw districts. Whether Kavanaugh is actually a swing vote is anyone's guess. He replaced retired Justice Anthony Kennedy, who truly was a swing vote on the issue of partisan gerrymandering. Kavanaugh could have been playing devil's advocate, as justices are sometimes prone to do; he could be simply unwilling to close the door immediately, in his first court term, on an issue he seems to recognize is a genuine problem; or he's actually interested in finding some limits to partisan gerrymandering. Kavanaugh also asked probing questions of attorneys arguing against the way the state drew the districts. Making the case against North Carolina was lawyer Emmet Bondurant, who opened his argument with this: "This case involves the most extreme partisan gerrymander to rig congressional elections that has been presented to this court since the one-person/one-vote cases." Bondurant, 82, happened to argue the Supreme Court case that established that congressional districts need to contain the same number of people in 1964 — when he was 26. North Carolina's map was struck down by a federal court in 2011, because it determined the map was gerrymandered on the basis of race, which is not allowed. So the state's GOP Legislature approved almost the same map, this time members said, on the basis of political affiliation so as to not be viewed as racially motivated. Bondurant argued that the North Carolina Legislature's defense is, well, indefensible. "They take the position that no matter how predominant the intent," Bondurant said, "no matter how extreme the effects, there are absolutely no constitutional limitations on partisan gerrymander." In other words, the North Carolina Legislature's map is so openly — and extremely — political, Bondurant argued, that the state's Republicans are essentially saying there are no limits to partisanship when it comes to redistricting. Kavanaugh seized on Bondurant's use of the word extreme — and pressed him on what he sees as a potential limit. 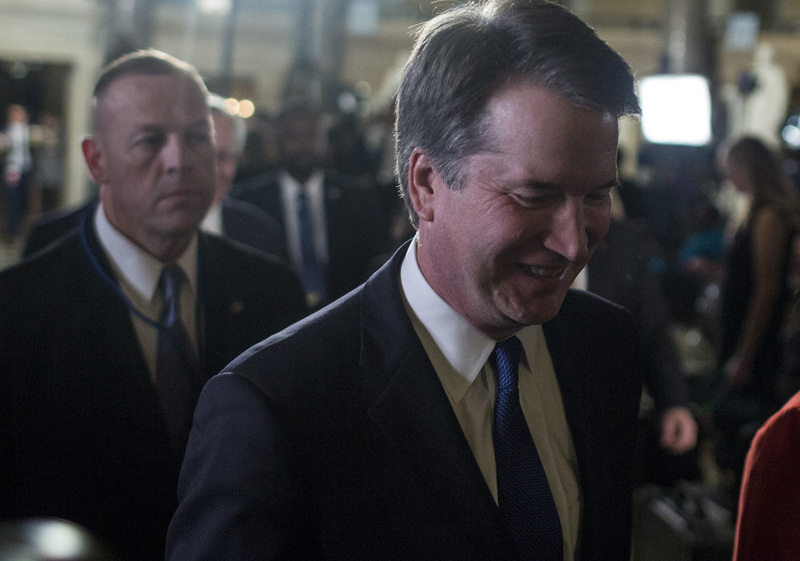 "When you use the word," Kavanaugh said, "when you use the word 'extreme,' that implies a baseline. Extreme compared to what?" "In this case, it is extreme in comparison to any statistical application of neutral redistricting principles in the context of the political geography of North Carolina," Bondurant replied. He cited randomized maps drawn by Jowei Chen, a political science professor and election maps expert at the University of Michigan, and noted that North Carolina's gerrymander was "not the result of chance. You can only achieve it by making partisan advantage the predominant motivation." The justices, though, continued to press Bondurant for a standard that could be applied broadly. Conservative Justice Neil Gorsuch also brought up referendums for independent commissions, which some states have approved, as an alternative. But Bondurant noted that "the vast majority of states east of the Mississippi, including specifically North Carolina, do not have citizen initiative." And that state legislatures have to ratify those ballot initiatives, so "that is not an effective remedy," he noted. Republican Gov. Larry Hogan, for example, has tried and failed four times to bring such an initiative in Maryland, where Democrats have controlled how district lines are drawn. Bondurant argued for the use of statistical models and mapping that results of them to find a line for fair maps. Justice Sonia Sotomayor noted, "[T]he reality is that with all statistical models — and we spend our lives based on them, insurance is paid on statistical models, health insurance premiums are based on statistical models." Even nuclear power plants, she noted, are based on statistical models. Justice Stephen Breyer hit on a key problem, however, with how the justices would likely try to make a decision. "[T]he problem I think your side throughout this morning has to deal with," Breyer said, "is from this side of the bench, to some people looking at the prior cases, there is a great concern that unless you have a very clear standard, you will turn many, many elections in the United States over to the judges." And if there's one thing Supreme Court justices want to do, it is stay out of politics. Clement, understanding this, put it this way to the justices: "[O]nce you get into the political thicket, you will not get out, and you will tarnish the image of this court for the other cases where it needs that reputation for independence, so people can understand the fundamental difference between judging and all other politics."